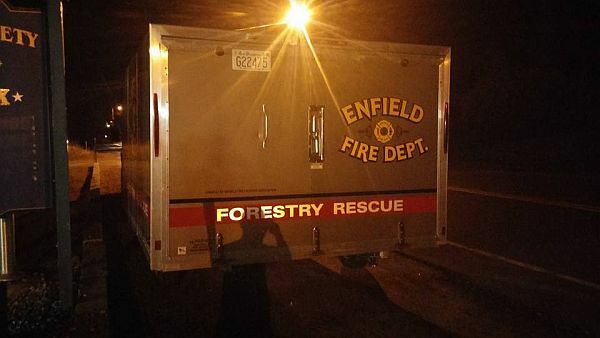 Canaan Fire, Canaan Ambulance Service, Enfield Fire Department, and Grafton Fire responded to a report of a stuck vehicle on Friday evening. Officials say the vehicle was about two miles past the gate on New Colony Road in Orange. Crews were able to successfully help all eight occupants out of the vehicle and back down the trail and brought to the fire station to wait for another ride. No injuries were received. Canaan officials would like to remind everyone that the New Colony Road is no longer a thru road to Hebron and is listed as Class VI road and GPS will not assist you on the road. A motorcycle accident closed Vermont Route 9 in Marlboro for over three hours on Sunday afternoon. Vermont State Police say the accident happened between South and Church Hollow Roads when Aime J. Paquette of Lowell Ma, failed to negotiate a curve, struck a guardrail and flipped his Harley. Paquette and his passenger Deborah Errico were thrown from the motorcycle and sustained incapacitating injuries. Paquette was transported to Brattleboro Memorial Hospital and Errico was flown to Dartmouth Medical Center. Route 9 was closed during the duration of the investigation and reopened around 3:00 PM. This crash is still under investigation and the state police are requesting any witnesses to contact 802-254-2382 with information. Good news for travelers and residents of Piermont NH and Bradford VT, the NH Route 25 Bridge opened to traffic Friday evening. The bridge closed on September 4th for a bridge deck replacement project. The Bridge was expected to reopen for traffic on Sept. 22nd, but work on the decking was completed one week ahead of schedule. B.U.R Construction, LLC of Claremont NH is the contractor for the project. New Hampshire’s Youth Waterfowl Hunting Weekend is this coming Saturday and Sunday, September 23-24, 2017. To participate, youth must be age 15 or younger and must be accompanied by a properly licensed adult age 18 or older. The adult may not hunt. The youth is not required to have a hunting license or duck stamp. All regular season waterfowl regulations, including shooting hours, use of non-toxic shot, etc., apply during the youth weekend. Specific seasons and bag limits for various waterfowl are listed on the Fish and Game website at http://www.huntnh.com. A Chester Vermont man is facing multiple charges after he allegedly forged checks and made online purchases using a disabled person’s credit card. Springfield Vermont Police started an investigation after a report from a disabled resident that over $2,000 of unauthorized deductions were taken from his checking account between Oct. 2016 and Jan. 2017. After an investigation, police say that Jeffrey Snyder allegedly uttered seven forged checks and made 20 online purchases with the victim’s accounts. In addition, Snyder allegedly used the victim’s debit card to make purchases from area businesses. During the investigation, a search warrant was executed at Snyder’s residence and multiple items that were allegedly been purchased with the victim’s debit card were located and seized as evidence. Snyder was cited to appear in Windsor Criminal Court on October 24th to answer to the charges of; Financial Exploitation of a Vulnerable Adult, Uttering a Forged Instrument, False Pretenses and Identity Theft.